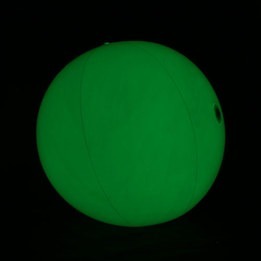 To add a touch of green to your evening festivities such as St. Patrick`s Day, a birthday, a beach party or the party of your choice, the 20 inches green light up LED beach ball is the bright item to get you. Very nice effect when several balloons float on a swimming pool or when you practice your volleyball in the evening. Made of white vinyl, the balloon measures 20 inches and has 3 sections of 3 replaceable AG13 batteries. You must inflate the ball and activate the 3 sections of light to have the nice effect expected. This product is not recommended for children under 5 years old.